Whatever you do, don’t call them fairies. 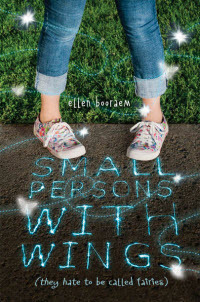 They are Small Persons with Wings, and Mellie’s family has the dubious distinction of an ancestral legacy (or curse) of obligation to the Small Persons. As long as the Turpin family holds the Gemmaluna, a magical moonstone that uncovers deception, they must provide a home to the Small Persons. What this means for Mellie is that when she and her parents move from Boston to her deceased grandfather’s dumpy inn in a coastal village, they inherit an infestation of artifice-loving Small Persons—and that tribe is rife with discord. Take cranky, squabbling Small Persons, bohemian, sweetly ineffectual parents, a nosy neighbor who happens to be the chief of police and his scrawny, likable son, and Mellie’s got her hands full. Booraem’s debut, The Unnameables (2008), presented readers with an utterly original American fantasy, and this follow-up, though unrelated except in its examination of creativity, is equally fresh and distinctive. Frequently hysterical dialogue, a hugely sympathetic protagonist and a baroque concatenation of magics and counter-magics will keep readers glued to this smart, earthy and thoughtful tale.